November 8, 2011–Watkinsville, GA –Lift Chairs 4 Less is proud to announce the return of the Golden 355L Monarch Lift Chair. 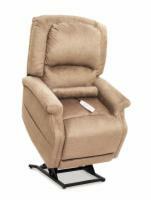 This is a fair priced three position lift chair with a wide seat to accommodate those who prefer a roomier seat. It is designed for people who are taller than 5’11” but not quite 6’2”. Lift-Chairs-4-Less.com is one of the leading online retailers specializing in lift chairs. They mainly carry Pride Mobility and Golden Lift Chairs because of the consistently high quality of their products. Based in Watkinsville, GA, their mission is to provide top quality lift chair recliners and unparalleled service in order to improve the quality of life for our seniors and disabled loved ones.